Sega's latest 3D Sonic looks like this. Sonic Mania, the 2D Sonic remix that actually holds a lot of promise, was recently delayed to Summer, and like pretty much all game delays at this over-saturated point in time, more than anything that news came as a relief. 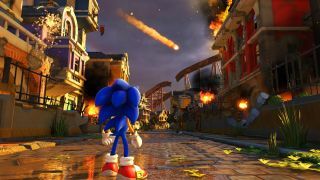 I can't say I'm particularly looking forward to Sonic Forces, however—Sega's next 3D Sonic that doesn't so much come with a bit of baggage but rather a couple of decades' worth of bad, crap, naff and cringey Sonic games trailing behind it. Looks alright. While the 2D Sonic Mania is due for release sometime this Summer, Sonic Forces will be out 'Holiday 2017', so sometime before Christmas.